Give your law firm a competitive edge like no other by providing your clients a quicker, more secure and accurate service. LawConnect is a secure document management system for law firms and their clients. It seamlessly integrates with LEAP. As a cloud-based product, your clients’ documents are safely stored in an organised location which can be accessed from anywhere, any time. 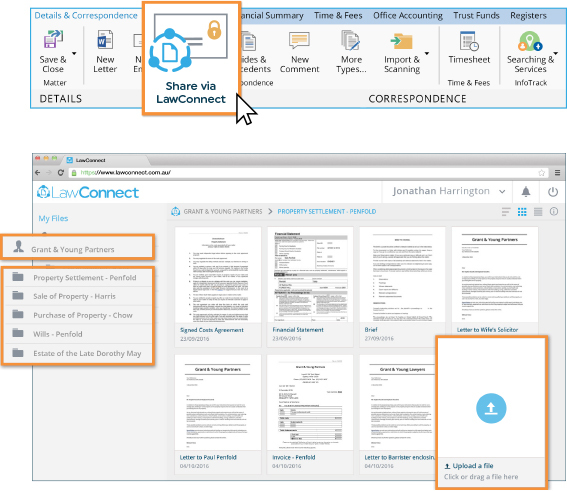 Using LawConnect gives you better control over the documents you share. You can see if a client has viewed a document, you can access shared documents instantly and you can revoke access if necessary. LawConnect provides a secure environment for your firm and your clients to collaborate in real-time. Any party with access to a document can comment and reply on it, making LawConnect ideal for reviewing and refining a document. All parties are kept up-to-date via email with any comments and replies left on a document. Due diligence documentation in commercial transactions. Thousands of consumers use LawConnect to view the documents that their lawyers want to share with them. This add-on is available with LEAP in the cloud only. An alternative to email Email is not secure. Using LawConnect, the documents are never sent using email and cannot be sent to a wrong party by mistake. Security All documents are safely stored on Amazon Web Services, the same facilities used by LEAP. It is one of the safest and most secure server providers in the world. Transparency In LawConnect, all parties can view the same version of a document, so you can see instantly whether a client has opened a document or not. Mobility Storing your document with LawConnect means you have access to your documents anywhere, any time. Greater Collaboration Review documents with clients, lawyers, barristers and other parties in real-time with LawConnect’s Comment and Reply feature. Competitive Edge Providing a quicker, more secure and transparent service to your clients offers your law firm a competitive edge like no other. Efficiency This direct lawyer-client file integration means you can be more efficient and productive without compromising security.